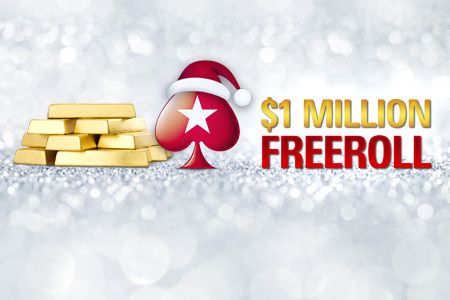 The final $1 Million Freeroll of the year kick-starts the festive month on December 1. For the chance to claim part of the $1,000,000 prize pool, players will need to complete a simple daily challenge between November 21-29 to secure a seat in that day’s All-in Shootout qualifier to win a place in the $1 Million Freeroll. There will also be an extra chance for players to take part in the Last Chance Skill Qualifier tournament which will take place on the day of the $1 Million Freeroll. PokerStars’ Christmas Calendar runs from December 1-25 offering $2 million in prizes throughout the holidays. Every day, players will be able to unlock a new promotion or activity to complete in the Challenges window of the PokerStars client. There will be something for everyone to enjoy, including Spin & Go challenges, deposit bonuses, freerolls and giveaways a-plenty that offer lots of chances to win a share of the $2 million in rewards and bonuses up for grabs. Hidden behind one of the Christmas Calendar doors will be an epic MicroMillions Marathon day with 21 low buy-in events! The highlight of the day will be the MicroMillions Marathon Main Event with a buy-in of $22 and $1 Million guaranteed. The seasonal celebrations conclude on December 26, when the usual Sunday Million tournament becomes a special $2 Million guaranteed Monday Million, featuring a first-place prize of $200,000. The tournament will begin at 14:30 ET and carries a $215 buy-in. Online Sit & Go satellites to the event will run around the clock throughout December. PokerStars is the world's most licensed online gaming brand, holding licenses or related operating approvals in 16 jurisdictions. Play Responsibly! For more information on responsible gaming please visit our website at http://www.pokerstars.com/about/responsible-gaming.